Here’s another annoyance I just ran into today. 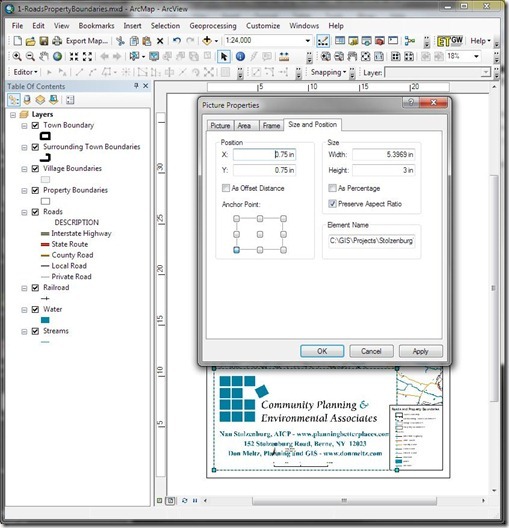 When I try to resize an inserted graphic in a map layout using the Picture Properties dialog box, the new values are not saved. In fact, when I open the Picture Properties dialog of a graphic that has been resized, it reverts to its original size, even without saving it. Here’s what I’m trying to do. So why am I complaining? Well, I want the logo border to line up exactly with the border of the white rectangular graphic it’s placed over. I can get it close freehand, but I have to set a guide and snap to that in order to get the size just right. Also, if I open the properties dialog again to change anything, even if it’s not related to resizing, I have to go through this process all over again. That’s very annoying. Now I’m not one to complain about a company having a few bugs in a newly released piece of software, especially something with as many changes to it as ArcGIS 10 has. What bothers me about this bug is, it apparently will not be fixed in the recently announced Service Pack 1! This, ladies and gents, is going to be a major annoyance. 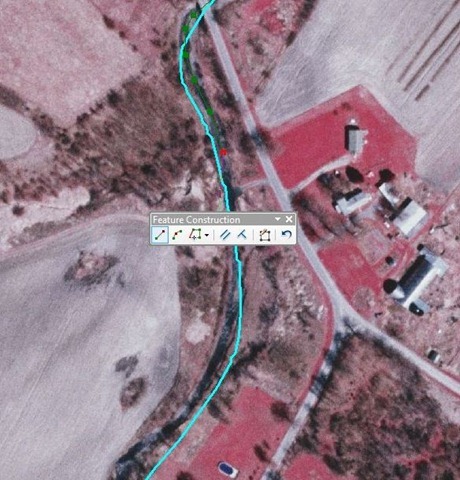 This entry was posted in GIS and tagged ArcGIS Annoyances on September 25, 2010 by Don. 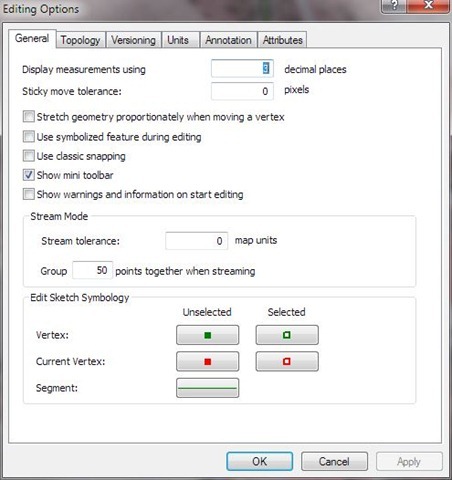 I’ve been doing a lot of editing in ArcGIS the last few days, and have run into quite a few things that really annoy me about the new interface in version 10. 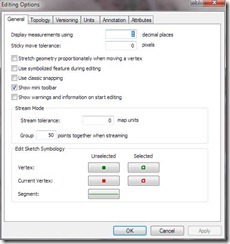 The editing environment received a major facelift in this version, and that’s where most of my complaints are. Don’t get me wrong, I’m all for trying out new things. I am attracted to shiny objects. The thing is though, once the shininess of an object wears off there has to be some functionality left in order for the object to remain useful. I’m pointing out a minor annoyance here because I want to keep this post short. However, there are a few more significant annoyances I plan on talking about in the future. The default tools on the Feature Construction mini-toolbar are mostly available on the Editor toolbar, and of course all of them can be added there through customization. When I’m editing, I typically place or move dozens, if not hundreds, of vertices before needing to use an item on the toolbar. So, the mini-toolbar has dozens, or hundreds, of chances of getting in the way before I have a need to use it just once. This is not handy. This is an annoyance. 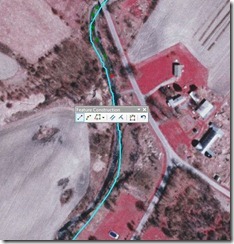 This entry was posted in GIS and tagged ArcGIS Annoyances on September 23, 2010 by Don.